Are you looking for somewhere to stay on your next visit to Cumbria to get in a round of Golf? 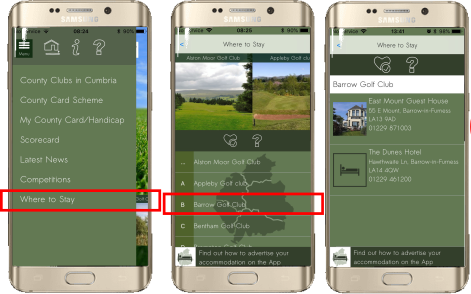 Then take a look at 'Where to Stay' on the Cumbria Golf App that lists accommodation near to the County Golf Clubs in Cumbria. 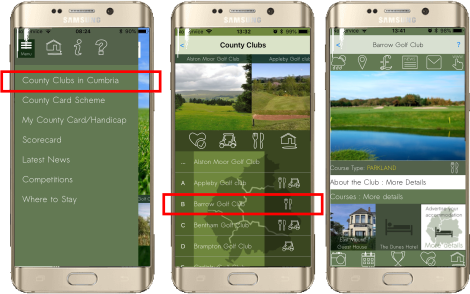 You can also access accommodation by selecting 'County Clubs in Cumbria' from the main menu and choosing an individual Golf Club as shown below. Browse Website - This option will take you directly to their website. Send Email - This option allows you to directly send an email. Call - This option allows you to call the establishment directly from your phone. Add to Favourites - This option allows you to add them to your favourites. Use the form below to register your accommodation for inclusion on the App. If you are interested in having an upgraded listing then please choose the option below. Please make sure you fill in all fields marked with an *. A note about image sizes: The listing image should be no smaller than 150px x 150px with all other images no smaller than 250px x 250 px. Please check over the form before you submit it to us and make sure that all relevant fields have been filled in. Once complete please click the submit button below. If you have chosen to have an upgraded listing you will be contacted shortly after you have submitted the form for payment. Please note: Your upgraded listing details will not be added until payment has been processed. Your accommodation will be added as a standard listing until then. 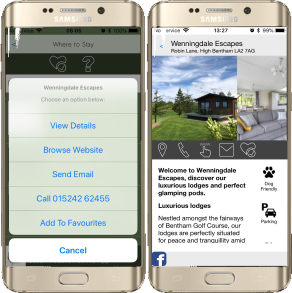 NB You may be contacted by our App designer Buzy Bee Software Services to provide assistance where required with your submission information.